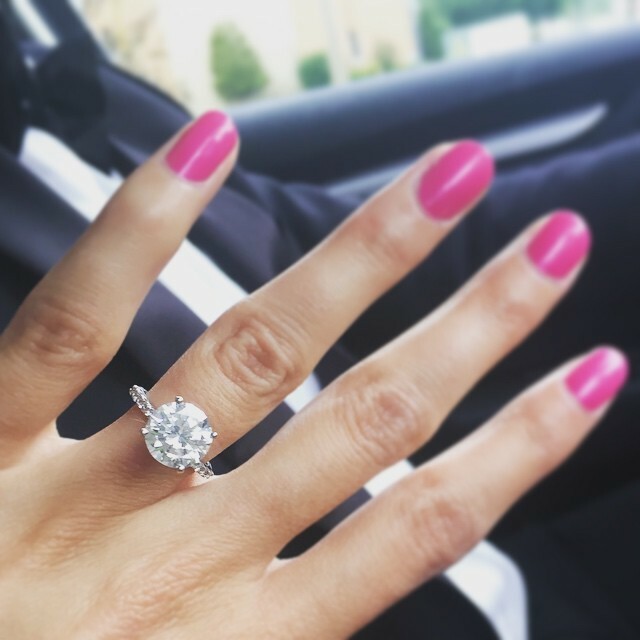 If you just got engaged, chances are you’ll be sharing the great news through an Instagram engagement ring selfie. While you may not be into mirror selfies, post-workout selfies or duck-face selfies, the ring selfie is something sacred. Get the photo just right by following a few simple rules of thumb—er, ring finger. If you’re not outside, set up your shot near a window for some natural light. If you take an iPhone photo in a dimly lit room, you’re pretty much guaranteed a blurry photo. Flourescents and yellow bulb lights aren’t much better. Trust us–you want natural sunlight. Whether you’re inside or out, watch out for tricky shadows. Experiment with the angle of your shot so you capture the most amazing qualities of your ring. Love the unique setting? Take a photo on an angle to highlight it. Can’t get over the shape of your stone? Try an overhead shot (but remember, skip the flash). Everyone wants to see the ring, but no one wants to see your hangnails. If your fiancé caught you with a surprise proposal and you’re due for a manicure, but just can’t wait to snap a photo, put on a little lotion and get creative with your pose. Hold hands with your fiancé, frame your nails out of the shot or do a fist pump pose at the camera—why not? Unleash your inner photo stylist. Find an Instagram-worthy skyline, latte or patterned pillow to serve as the backdrop of your ring selfie. Cell phone pics will never be professional quality, but there are a few tricks to make your shots look almost as crisp. Avoid the zoom on your camera— physically moving your phone will make a less pixelated photo. If you’re using an iPhone, set up your shot and then tap the screen to focus the lens. Avoid shaky shots by pushing the buttons on your earbuds to snap a photo instead of tapping your screen. Say good-bye to creepy hands by relaxing your fingers, adding a prop or resting your hands on your new fiancé’s arm. Avoid shots that highlight every pore and strand of hair on your hands by a slight tilt of the camera—or your hand—instead of shooting straight on. Take lots of options, but only upload one. You want your ring to stand out and look awesome. Skip the collages and pick one great shot to feature. Fix it before you post. Use an editing app! Apps make it easy to experiment with cropping, contrast, saturation and sharpness to get the very best from your digital photo. If all else fails, use a filter. Instagram’s go-to filters made it easy for anyone to take a share-worthy photo. Add your ring selfie, apply that perfect Valencia filter and done. If ever there were a time to be sentimental, it’s now. Write the caption about marrying your best friend, get creative with the emojis and tag the location of your proposal to share on social media.